I saw a guy eating nachos over the weekend. Then I saw that same guy dunking tortilla chips in ketchup instead of nacho cheese. Ketchup people? That’s just gross. These cupcakes, on the other hand, are the opposite of gross. Even people who think bananas are gross, love these. 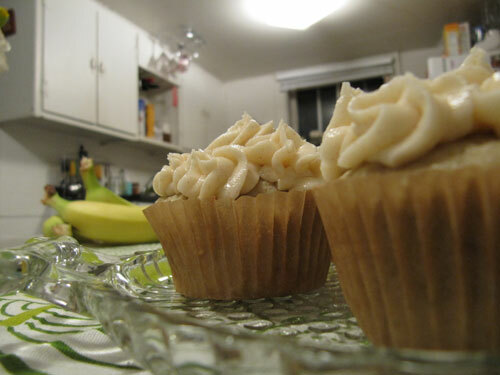 At least one lovely banana-hater that I know, sure loved her cupcake despite the whole banana-hating thing. 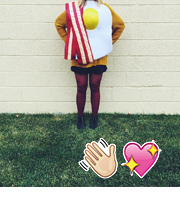 So it turns out the art director I’ve been working with is moving on, and her last day of work was yesterday. She’s the kind of girl who loves banana everything … banana cream pie, banana boats, a pancake loving nannerpuss and roasted banana cupcakes. So there you go… So just for her, I made these cupcakes! These cupcakes have a way of disappearing. You’ll take one bite, thinking you’re going to save the rest for later, but you’ll find yourself sitting there with a crumb covered cupcake paper and a sheepish face. It’ll happen… Don’t say I didn’t warn you. Preheat the oven to 400°F. Place 3 whole unpeeled bananas on a baking sheet and roast for 15 minutes. The peels will darken (like below). Remove from oven and allow to cool before peeling. Reduce the oven temperature to 350°F. Line a regular muffin tin or two with 16 paper liners. Sift together cake flour, baking soda, baking powder and salt. With an electric mixer on medium-high speed, cream the butter and sugar until pale and fluffy. Add egg yolks, one at a time, beating until each is incorporated, scraping down the sides of the bowl as needed. Add roasted bananas, and beat to combine. Add flour mixture in three batches, alternating with two additions of sour cream. Beat until just combined after each. Beat in vanilla. In another mixing bowl, with electric mixer on medium speed, whisk egg whites to soft peaks; fold one-third whites into batter to lighten. Gently fold in remaining whites in two batches. Divide batter evenly among lined cups, filling each three-quarters full. 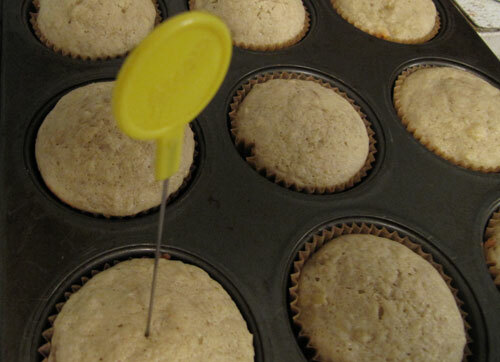 Bake, rotating tins halfway through, until a cake tester inserted in centers comes out clean, about 18-20 minutes. Transfer tins to wire racks to cool completely before frosting. With an electric mixer on medium speed, beat all ingredients until smooth. Use immediately, or refrigerate up to 5 days in an airtight container; before using, bring to room temperature and beat until smooth. 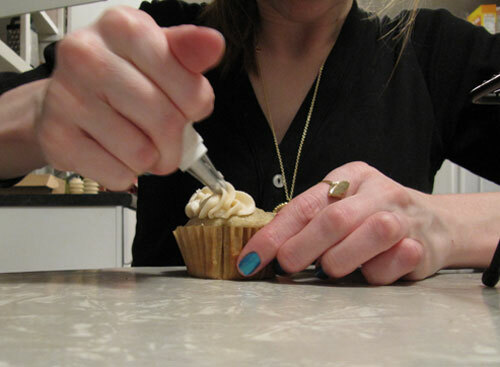 Pipe frosting onto your cooled roasted banana cupcakes! These look beautiful!!! 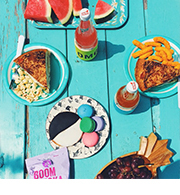 Makes me want to do more than just peel and munch on the bananas sitting in my fruit basket. Thanks Sally! I totally think you should make these soon. They are reallyyyyyyyy good. Oh Elliot’s totally right below the table in all the pictures. I’ll make sure he makes an appearance in the next post. 🙂 He’s really into catching things if they fall off the cooling rack. 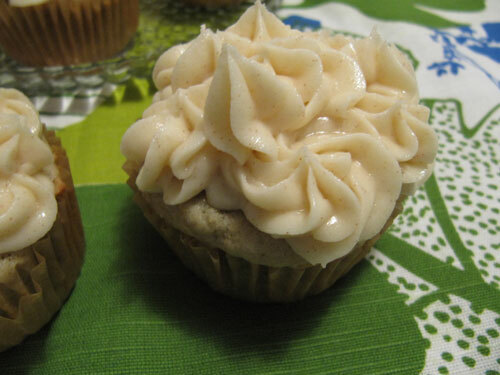 I recently got the Martha Stewart cupcake book and it is full of so many wonderful cupcake ideas! Fabulous! I agree about Martha’s cupcake cookbook. I want to make every one of them! I’m glad you liked them, Brianna. I can’t stop thinking about them! I just made these and loved them. My husband thought they tasted like muffins, but liked them too. I didn’t have cake flour so subtracted 2 tbsps all purpose and added 2 tbsps cornstarch. Could that have made them more muffin-esque? Hey Amber! I’m glad you liked these guys. P.S. The cake flour substitution could’ve made them more muffin-like. Sometimes fruity cupcakes have a way with being muffin-y rather than cake-y. Glad you liked them regardless!